Thank you for coming to visit my new Blog. I am very excited that I can share my thoughts with you! I know that we are all connected, and now even more, thanks to the BIG WEB,, the INTERNET, YOUTUBE and all the social media platforms. We are living in a very exciting new age now, the digital age. May you be happy and joyful today and embrace the day with joy and enthusiasm, knowing that only good can come to you! A new day has begun. To me, each day is a new life, because I like to think that each day is a new opportunity to start afresh, and forgive the mistakes of the past.. I like to say to myself: “It is okay to make mistakes while learning.” I like to begin each day by giving thanks for my life, for all my blessings and opportunities. I give thanks for my family, friends, associates and all of you, my supporters and followers. This feeling of gratitude helps me to stay inspired and motivated for the day ahead. Now that my website is almost completely finished, I will be making new paintings, making new videos and I will be working on a series of paintings called “TREES, ROOTS AND FLOWERS.” These paintings will be semi-abstract, pointillistic and impressionistic. Trees fascinate me… and I am so thankful to live in a neighborhood full of beautiful trees, particularly oak trees. The flower are in bloom right now, and the colors of the flowers and the leaves are fantastic. It is a pure joy to look at Nature! Soon, I will be making videos on YouTube, in which I will post painting tutorials for beginners. YES! I will teach what I have learned in oil painting. My favorite medium is oil paint and I am willing to share with you my painting techniques. It is my intention to share these paintings to bless, inspire, elevate, heal and dignify the minds and hearts of men and women in this universe. I hope to bring a message of hope, peace, love, joy and optimism to the world. Please enjoy the content of my website and my blog, and enjoy your painting and your life, whatever you may do in this life, enjoy every moment of it. Each moment is precious! Be present in the Present Moment. NOW is all we have. 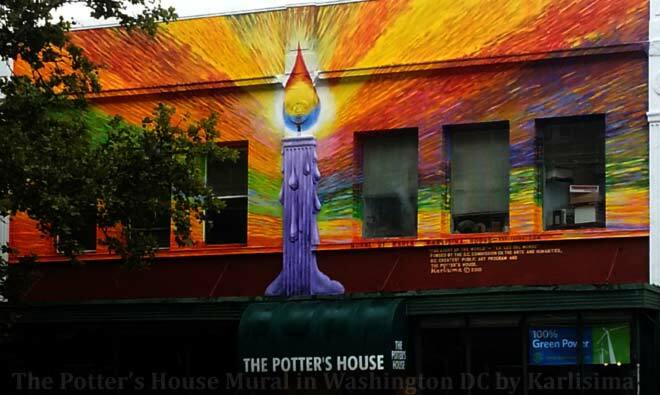 The Mural was painted over in 2014. And don’t forget to BREATHE! …Take a deep breath and enjoy the JOURNEY OF LIFE! It is a wonderful life and a wonderful journey, indeed, and we are so blessed to be alive! Until next time! Hasta pronto! Hasta luego! There are many things that inspire me. For example, I get inspired by the trees and their branches and leaves, and by the colors of the flowers and the light reflected on the side walks and the streets and the shadows created by that light. My mother always told me to observe nature and to pay attention to its murmurs and whisperings. 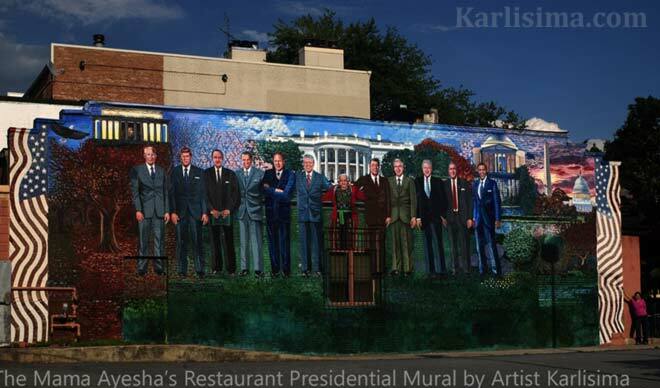 The Mama Ayesha’s Restaurant Presidential Mural is one of my biggest accomplishments. I would like to share it with you and with humanity. 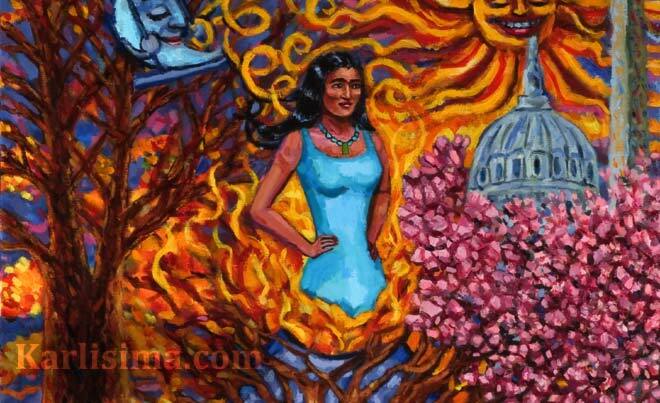 The address is 1967 Calvert Street NW, Washington DC 20009 at Mama Ayesha’s Restaurant, Middle Eastern Cuisine. I thank God it is finished! Mural done by Karlisima and inaugurated to the public in 2012. It is a gift to the city, to the Nation and to the world.